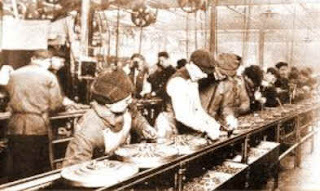 Antes da Revolução Industrial, nos sistemas de trabalho de base artesanal, o processo produtivo era determinado pela habilidade do trabalhador, devidamente preparado e qualificado para o manejo de suas ferramentas de trabalho. Desse sistema decorriam sérias limitações de produtividade, de padronização e custos, tornando os ofícios de manufatura extremamente dependentes do fator humano. Com o advento da maquinização do processo produtivo, via difusão tecnológica da máquina a vapor, a dependência de trabalhadores qualificados torna-se rapidamente menor. Agora o trabalhador torna-se operário, aquele que responde e alimenta o processo de produção mecanizado, realizando tarefas simples, determinadas e mensuráveis. A qualificação para formação dos antigos artesãos não é mais necessária, a produtividade é maior, os produtos são padronizados e os custos diminuem consideravelmente. O ápice desse modelo é expresso nos ganhos de economia de escala e na divisão do trabalho no processo produtivo do taylorismo e fordismo. Progressivamente, porém, o incremento da estrutura física na composição orgânica do capital, com o advento e evolução das práticas gerenciais e o desenvolvimento da tecnologia da informação, torna novamente necessário o investimento na formação e qualificação do trabalhador. Esse movimento se dá, de um lado, no chão de fábrica, pela introdução de maquinaria cada vez mais complexa e proficiente, a qual necessita de um técnico ao invés de um operador (com grandes vantagens de aumento de produtividade e eliminação de postos de trabalho no setor fabril) e, de outro lado, pela necessidade de atualização, qualificação e adaptação constante atribuída aos postos de trabalho gerenciais. A produção manufatureira americana permaneceu quase imutável em termos de porcentagem do produto nacional bruto nos anos do ‘declínio gerencial’. Ficou em 22 por cento do PNB em 1975 e em 23 por cento em 1990. Durante esses vinte anos, o produto nacional bruto cresceu duas vezes e meia. Em outras palavras, a produção manufatureira total dos Estados Unidos cresceu mais de duas vezes e meia nesses vinte anos. Desta forma, o capitalismo entra numa fase onde a formação do trabalhador, sua educação e propensão a aprender, se confunde com sua capacidade operacional. Daí porque muitos autores falam em “economia pós-industrial”, “sociedade pós-capitalista”, da necessidade de reconfiguração do conceito de trabalho, de “trabalhador do conhecimento”, num contexto de mudanças e quebra de paradigmas. Ahead of the group, fast-walking Andy was trying to set a new speed record. Behind, fat Herbie was setting the slowest pace. So, the group started to spread in the woods (like an increasing inventory level in a plant). They were supposed to cover 10 miles in five hours, but they are going just half the necessary speed. What to do to improve their efficiency? To solve the Boy Scout troop problem, Alex Rogo asked the group to stop and join hands. Than, like dragging a chain, he passed through the line until the entire troop had exactly the opposite order they had before. They started walking again with the condition that nobody could pass anybody. This time the group stuck together, but some of the boys started to complain that they were going too slow. In fact, keeping that pace they couldn’t accomplish the planned schedule. So it was necessary to elevate the constrain, the first boy in the line, the fat Herbie. They realized that Herbie’s pack was too heavy, full of things like soda, spaghetti, candy bars, pickles, and even an iron skillet. Then they decided to split the load among others members of the team and, this time, they really improved their performance as a group. Israeli physicist Eliyahu Goldratt notice that there was plenty of room to improve the exploitation of resources in manufactures plants. With his associates he created a company named Creative Output, in the beginning of 1980’s, developing a software to schedule jobs through manufacturing processes, focusing on bottleneck operations. The Theory of Constraints is the result of broadening this scope, applying a problem-solving approach which seeks to improve the global objective of a system through the understanding of the underlying causes and effects dependency and variations. The first step is to break the current view (focusing on local optima) and start to consider the effects of local changes in the whole results. This vision inspired the analogy of the system as a chain. If we imagine a system as a chain, the only way to increase its strength is to improve the weakest link. This is the point where the chain will broke soon or later. If we improve any other link, letting the weakest one aside, the strength of the chain will keep absolutely the same as before (as stated in the “Law of the Minimum”). Only when the weakest link is strengthen the overall system will be improved. And when the weakest link is strengthen to the degree that it is no longer the weakest link, there will be another weakest link limiting the system performance. The concept behind the “Law of the Minimum” and the view of the system as a chain are the basis for the Theory of Constraints. This primary approach constitutes a valuable orientation defining which actions should be taken to improve the overall performance of a system. The constraint can be found inside the organization (lack of hardware, software, people, machines, etc. ), can be the result of a controlling policy, or can be located outside the company (market, suppliers, infrastructure, etc.). Focusing local optima, not considering the overall impact of compartmentalized efforts, is just waste of time and money. Unfortunately, focusing local performance, without identification of neither the weakest link nor the overall results, is common sense in organizations. That’s why managers are asked to improve local performance and demand the same to their subordinates. But the sad true is that the system will increase only at the same rate of improvement in its constrain (the weakest link). All other efforts, increasing output in non-constraint parts, will only result in waste of time and money. Instead of focusing on the best solution for each component it is necessary to look for the best possible solution for the entire system (global optimum), avoiding emphasis on local optimum. The overall result, in an ongoing system, is not exactly the sum of the results of each part, it is the result the weakest part makes possible in interaction with the others. Figure 1: A linear system of 5 resources. Now suppose, for simplicity, that this system produces only one item. Let’s say it can produce 10 units of item A per hour. But there is only market for selling 8 units. In this case, the system should produce only 8 items per hour, according to the constraint in this case (the market). Production above 8 units per hour will only represent cost since it cannot be sold, at least not without some kind of promotion which could affect profit margins. In a situation like that company’s efforts should concentrate in marketing and sales, not in improving the production output. Suppose now the demand for product A increased to 12 units per hour. The system can only produces 10 units/ hour, so these 2 extra units will represent unsatisfied customers, damaging the image of the company and attracting new competitors to the market. A fast solution would be expand the working time with extra hours (which would be costly and can negatively affect productivity and quality) or even outsource part of the production (if possible). But suppose these alternatives are not available. What should be done? Let's consider in more detail the capacity of each resource. The fact that the system is producing 10 units per hour doesn’t imply that each one of the resources produces exactly 10 units per hour. If this is the case, the system should be absolutely perfect, with each resource producing in a harmoniously constant way where each unit produced requires the same time (zero variations). There is no rework to be done, nor unexpected setups, problems in machines or with workers. But, if any variance occurs in one machine, all the sections downstream would be affected and the system could not produce 10 units per hour. Figure 2: Capacity level in each resource of a linear system. As we see, only resource 4 has the capacity of 10 units/ hour. This is the resource which is limiting the system’s performance. If we want to increase the throughput it is mandatory to improve the capacity of resource 4. Any effort to improve capacity in other resource will only represents increasing costs, not affecting overall performance. Before analyzing what could be done to improve capacity in resource 4, we should consider the flow of work through the system (how it is balanced). Imagine what would happen if the production schedule does not consider the impact of different capacity in resources? Unfortunately this is a common situation, because managers are asked to improve local optima. In fact, we are used to think the way that local performance anywhere improves overall results. So, what would be the result of exploiting capacity in any resource of this system except resource 4? Probably only increase of inventory in process. The throughput rate will keep the same at 10 units per hour. There is absolutely nonsense trying to reach local optimum everywhere. But who never observed a manufacture plant piled up of material in process? In our example, if we schedule production for 10 units per hour rate in each resource, the overall result will certainly be less than 10 units/ hour. Simply because any variance which results in less than 10 units/ hour in one resource would not be recovery by the others – this “balanced” system wouldn’t have any inventory in process for safety. And if at some time the system does not produce 10 units it also would not produce a higher rate afterwards in order to recover the production level. In synchronous manufacturing thinking, however, making all capacities the same is viewed as a bad decision. Such a balance would be possible only if the output times of all stations were constant or had a very narrow distribution. A normal variation in output times causes downstream stations to have idle time when upstream stations take longer to process. Conversely, when upstream stations process in a shorter time, inventory builds up between the stations. The effect of the statistical variation is cumulative. The only way that this variation can be smoothed is by increasing work-in-process to absorb the variation (a bad choice because we should be trying to reduce work-in-process) or increasing capacities downstream to be able to make up for the longer upstream times. The rule here is that capacities within the process sequence should not be balanced to the same levels. Rather, attempts should be made to balance the flow of products through the system. When flow is balanced, capacities are unbalanced. But there is still a missing point. As stated before, the market now is not the constraint of the system. In fact, if demand is higher than supply (as indicated by the fact that the system could sell 12 units/ hour if it would have productive capacity) it will not be possible to keep a shipping buffer, which would also not be necessary, since everything produced would sell immediately (output rate is not dictated by the market, but by resource number 4). Next figure presents the situation where the drum is represented by resource 4, which determines the amount of material that should be released in the system (represented by a rope). But if there is a problem at resources 1, 2, or 3, resource 4 wouldn’t be able to keep the output rate of 10 units/ hour and the entire system would be affected. Resource 5 will suffer the lack of material and, without a good shipping buffer, the sales level will decrease. Figure 4: Drum-buffer-rope system with constraint at resource 4. Situation gets even worse when the market is seeking for more products than it is possible to produce. In this case there is not a shipping buffer, so any delay in production represents a real decrease in sales. Since the market is buying, let’s forget the shipping buffer (otherwise we would keep it). Now we need to do something to protect the output rate of the system – and as the output rate is dictated by the constraint (drum), we should provide a shelter for the performance of resource 4. The solution is to keep inventory of material ready to use just in front of resource 4. If anything goes wrong at resources 1, 2, or 3, the system will not be immediately affected, since the constrained resource 4 could use this inventory to keep with the rate of 10 units/ hour. As soon as the problem is solved, the resources upstream should use their extra capacity (each of them can produce more than the constraint resource) to recover the previous level of the constraint buffer. When market is not the constraint, we should focus on keeping resource 4 producing without interruptions (the real problem is that if anything goes wrong exactly at resource 4). In the same way, if something happens to resource 5 the constrained resource 4 should not stop. So it would be necessary to leave free space in front of resource 4 (space buffer) in order to place its completed parts. Afterwards, resource 5 can use its extra capacity to eliminate excess inventory. Now the system is balanced according to the drum-buffer-rope methodology. On one hand, the output rate is dictated by resource 4 (drum) which regulates the production of upstream resources and the quantity of material to be released into the system (this is also regulated by the level of the constraint buffer, in case of any problem). On the other hand, the market regulates the necessary output for the constraint (depending on the system it might be necessary a shipping buffer – probably not the case if market seeks to buy more than the system can produce). Unfortunately, most systems are not simple as this example. There might be different products and occasions which could also imply in different constraints (keep the system balanced is not an easy task). But the point to highlight is that the overall system output rate is dictated by the constrained resource and not by the capacity of each resource individually. For instance, consider again resource 1 in the example. It has capacity for producing 25 units per hour, even though the system output rate is only 10 units/ hour. So, we could say that resource 1 is working only at 40% of its capacity. What is the current view about it? Bad productivity, low efficiency. Let’s suppose one hour of resource 1 costs $50. Producing 10 units/ hour means that each unit costs $5 at this resource. It would cost only $2 if it produces at 100% capacity. Most managers would increase production rate in this resource concerned with “saving costs”. But what will be the result for the entire system? Sales will increase? No, the overall output rate will keep at 10 units/ hour due to constraint in resource 4. Costs will decrease? On the contrary, since certainly the inventory level throughout the system will be higher (more money invested to produce the same as before). The local measure of cost per unit is just an illusion. But to overcome the assumption that a resource idle just represents waste is a heresy. It’s necessary to break a paradigm and states that if we want to exploit a system efficiently the first step is to forget local efficiency, then identify the constraint and work to elevate its output rate. AQUILANO, N.J.; JACOBS, F.R; CHASE, R.B. Operations Management For Competitive Advantage. 10th ed. Irwin McGraw-Hill, 2001. GARDINER, Stanley C.; BLACKSTONE Jr.; GARDINER, Lorraine. The Evolution of The Theory of Constraints. International Journal of Management, 2001, pp. 13-16. OREEN, Eric; SMITH, Debra, MACKEY, James T. The Theory of Constraints And Its Implications For Management Accounting. North River Press, 1995. SENGE, Peter M. The Fifth Discipline: the art and practice of the learning organization. Randoum House, 1990. 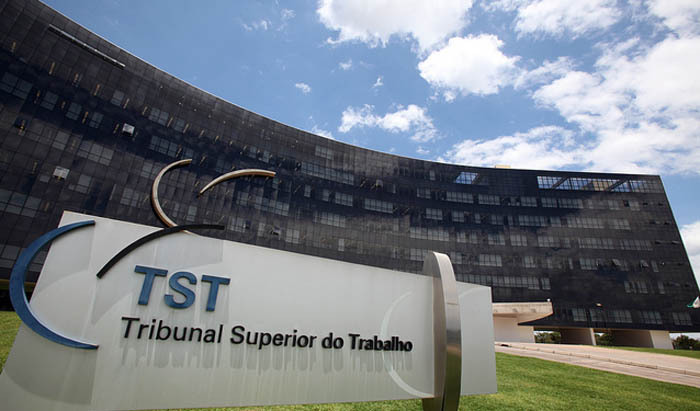 Em setembro de 2012, o Tribunal Superior do Trabalho (TST) analisou e atualizou suas súmulas. Antes prevalecia o entendimento que o que foi negociado em convenção ou acordo coletivo era válido apenas durante sua vigência. Agora o entendimento do TST é que benefícios concedidos pelas empresas nessas negociações, mesmo levando-se em conta que convenções e acordos coletivos têm um período de vigência específico (até 2 anos, art. 614 da CLT1), só podem ser cancelados quando, em nova negociação, for explicitamente indicando no documento o cancelamento ou modificação do que foi previamente concedido. Ou seja, se for negociada uma nova convenção coletiva e nada for dito a respeito de um benefício concedido na convenção anterior, considera-se que aquele benefício continua valendo mesmo não integrando o texto do novo documento. Diante dos primeiros questionamentos a respeito, alguns ministros do TST lançaram um artigo defendendo a nova súmula ("A Súmula n° 277 e a Defesa da Constituição")2. (...) A ideia era a de não mais permitir que a abstenção patronal, a recusa de participar da negociação coletiva, fosse um modo de o empregador obter a vantagem da redução ou suspensão de cláusulas normativas. Ao meu ver, nada mais retrógrado, ultrapassado e paternalista, muito distante do "terceiro milênio" do que essa visão apresentada nas passagens acima, onde os empregadores só estariam interessados em levar vantagem, em cancelar benefícios dados aos trabalhadores. De igual modo, com essa atitude super-protecionista, limitando diretamente a autonomia das partes que negociam uma convenção coletiva (princípio da autodeterminação coletiva), parece que os ministros duvidam da capacidade dos sindicados dos trabalhadores de defender seus representados. Na realidade, quando os empregadores concedem benefícios aos trabalhadores eles o fazem mais ou menos observando três aspectos principais: (1) o custo desses benefícios, (2) o retorno esperado e (3) a pauta de reivindicações apresentada pelo sindicato. Naturalmente, todo benefício concedido tem um custo. Nada vem de graça, é o empregador que terá que conseguir recursos para cumprir o que foi estabelecido. E a concessão dos benefícios tem por base a pauta de reivindicações dos sindicatos (a qual, espera-se, esteja adequada aos interesses dos trabalhadores). Mas isso não significa que as empresas aceitem a concessão de benefícios apenas por pressão na negociação coletiva e preocupação com os custos envolvidos. Também deve ser considerado se tais benefícios podem melhorar o ambiente de trabalho, se podem trazer maior satisfação, se podem contribuir, consequentemente, para o aumento da produtividade. Empregadores que não se preocupam com o ambiente de trabalho em suas empresas estão dando um tiro no pé, pois acabarão sendo diretamente prejudicados. Diante dessas preocupações, mesmo a concessão de benefícios não é algo simples, devido às limitações legais burocráticas e paternalistas (veja o exemplo da concessão de cestas básicas, já tratado AQUI). Uma negociação coletiva não tem que ser uma guerra, com os empresários numa trincheira e os trabalhadores na outra (e a Justiça do Trabalho despejando bombas de avião). Infelizmente, quem for negociar convenção coletiva a partir de agora, em nome dos empregadores, deverá evitar ao máximo a concessão de novos benefícios. Afinal, se novas concessões podem ser viabilizadas agora, quem garante o dia de amanhã? O risco do negócio é sempre muito alto e incerto. De outro lado, o sindicato pode naturalmente se inconformar com esse posicionamento. Como justificar aos seus representados que, embora não tenha conseguido nada de novo, pelo menos manteve o que foi concedido anteriormente? Ao que parece, seria pretensão do TST diminuir esse tipo de demanda junto à Justiça do Trabalho. O efeito prático, porém, pode ser justamente o contrário. Não seria surpresa se o número de dissídios na Justiça do Trabalho aumentasse, já que agora as partes terão menos autonomia para compor acordos e uma maior preocupação em manter o que já foi estabelecido. Nada mais lógico que, ao mudar seu posicionamento, o TST estabelecesse que tal valeria a partir do momento que reviu a Súmula 277. Não faria sentido dizer o contrário. Infelizmente, não é essa a realidade. Embora haja entendimento que a aplicação da nova súmula deva se dar a partir de sua publicação3, também existe absurdo entendimento no sentido contrário4! Quem garante qual posicionamento irá prevalecer nos casos concretos, nos juízos de primeira instância? Mesmo se o TST firmar posição para que a súmula tenha aplicabilidade apenas após sua nova redação, quem garante que os juízes de primeiro grau e os Tribunais Regionais do Trabalho seguirão esse entendimento? Sem contar que é sempre muito difícil conseguir fazer um recurso chegar até o TST, devido às formalidades e requisitos, além do tempo e custos envolvidos. Decerto irão surgir ações questionando benefícios que foram revogados tacitamente em convenções coletivas anteriores (que era a regra aceita). Teremos um ambiente de maior judicialização e incerteza, prejudicando as relações de trabalho e dificultando novas negociações. Espero estar errado. Considero que esse episódio demonstra, mais uma vez, que o Brasil não é um país indicado para o empreendedorismo. Continuo a desaconselhar a atividade empresarial por aqui. 2. CARVALHO, Augusto C. L.; ARRUDA, Kátia M.; DELGADO, Mauricio G. A Súmula n° 277 e a Defesa da Constituição. Tribunal Superior do Trabalho, dez. 2012. Disponível em: <http://aplicacao.tst.jus.br/dspace/bitstream/handle/1939/28036/2012_sumula_277_aclc_kma_mgd.pdf?sequence=1>. Acesso em: 03 jan. 2013. <http://www.migalhas.com.br/Quentes/17,MI168977,11049-4+turma+do+TST+modula+a+aplicacao+de+nova+redacao+da+sumula+277>. Acesso em: 03 jan. 2013. 4. TST Começa a Aplicar Súmula Sobre Convenção Coletiva. Valor Econômico, 07 dez. 2012. Disponível em: <http://www.valor.com.br/brasil/2931574/tst-comeca-aplicar-sumula-sobre-convencao-coletiva>. Acesso em: 03 jan. 2013.